Is This Where You Drink Wine? If you’ve ever been to Tom Eddy Wines in Napa Valley, you know that we’re located about 4 miles out of Calistoga and about 1,000 feet higher. What you may not know is that we are not open to the public. In other words, according to County law, you must first call to make an appointment. Since this is our home, workplace, studio, garden, etc. you can imagine that we’re pretty private and not keen on having a lot of visitors, normally. But having serious wine buyers over? That’s a different story. Kris: Are you going to open it to the public? Tom: It’ll be very private. By appointment only. You know, since 1991 in Napa Valley, they passed a law that any new winery must be “by appointment only” and cannot be public. Kris: Ok, I want to know your secret…what questions do you ask to screen people? Tom: We ask them about 3-4 questions. First, we’ll ask them how they found out about us. If they can’t remember, they’re out. If they say they bought the wine at the grocery store, and the wine was 10 years old, and they got it for $19 and it was the best wine they ever had, then they’re out. The last question we’ll ask is: “How big is your cellar?” If they reply with “3,000 bottles,” we’ll say“Well, we’ll send a car to pick you up.” <laughs> If they say, “We don’t have a cellar, but we have 2 wines in our refrigerator,” then chances are they’re not serious about wine. 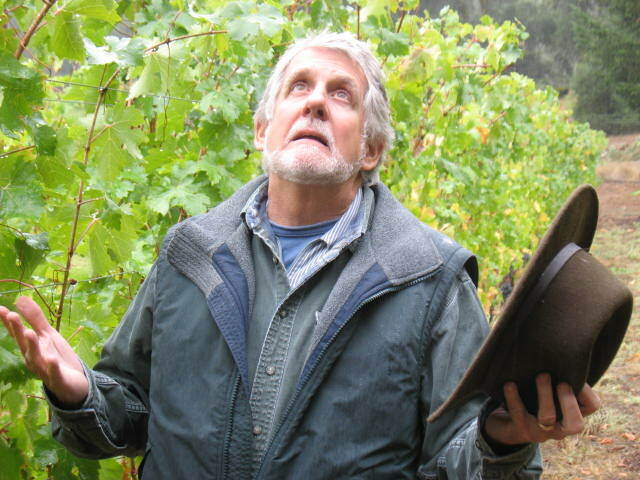 Pruning decisions are perennial choices made by every vineyard manager across the globe. 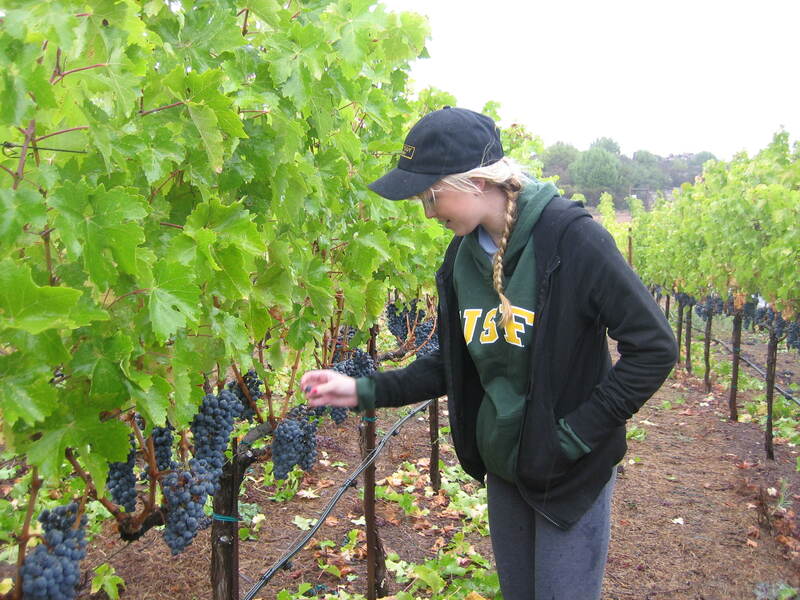 With a few years behind it now, Kerry’s Vineyard (www.kerrysvineyard.com) is graduating from vinifera adolescence and transitioning into adulthood. As the vineyard solidifies into a relatively permanent yearly routine, a very important decision needs to be made regarding the training system of the vine. The inherent nature of a vine and its chaotic growth patterns allows it to be sculpted into an infinite variety of somatic plant structures. There is no one right way to train a vine, but through cultural influence, local trends, experimental research and historical practices, certain standards of training have emerged. 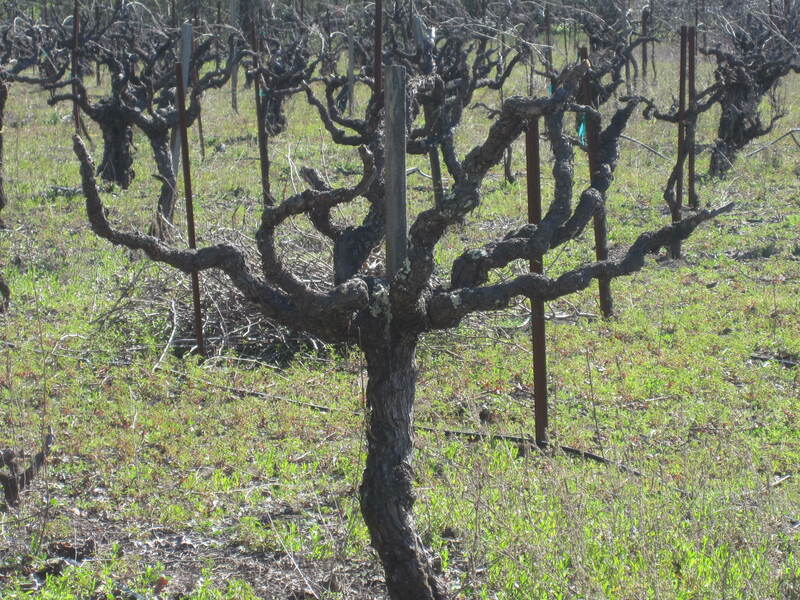 In Napa Valley, there are three main styles of pruning in the vineyard: head-trained, cordon, and cane pruning. This year, in Kerry’s Vineyard, it is time to decide between either cordon or cane pruned training (if we wanted to go head trained, that decision must be made almost immediately after planting the vineyard, whereas the first few years of cordon or cane pruning are the same). To put it simply, the arms of the vine that run parallel to the ground eventually produce many new shoots which will be the source of the individual grape clusters. 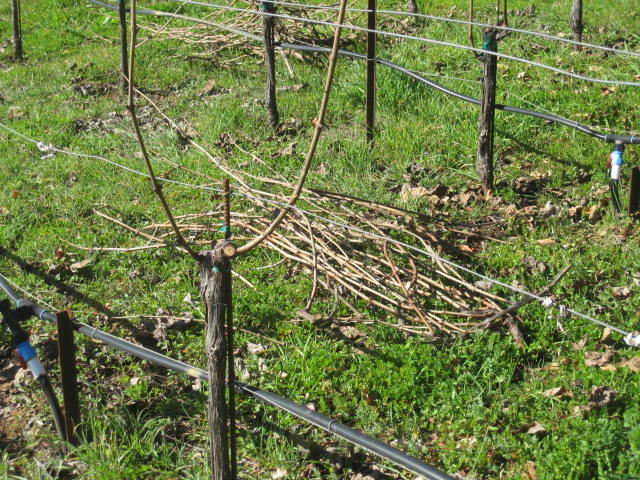 In cordon training, the parallel arms are permanent structures on the vine and remain year after year whereas in cane pruning, the parallel arms are formed every year by leaving one-year old shoots leftover from the previous harvest.The main difference between the two styles is that cane pruning will yield slightly more fruit. Because Cabernet Sauvignon is a lower yield variety and because Kerry’s Vineyard is on a hillside (as opposed to the valley floor), we have chosen to go with cane pruning for the Estate vineyard. As you drive up and down Hwy 29 and Silverado Trail in Napa Valley, you will see mostly cordon trained vineyards. Because these vineyards are planted on the valley floor, which is rich in nutrients and water, the vineyard managers are hoping to lower the yields of these vines by using the cordon training method. This will in turn help to balance the vine and produce better quality grapes. 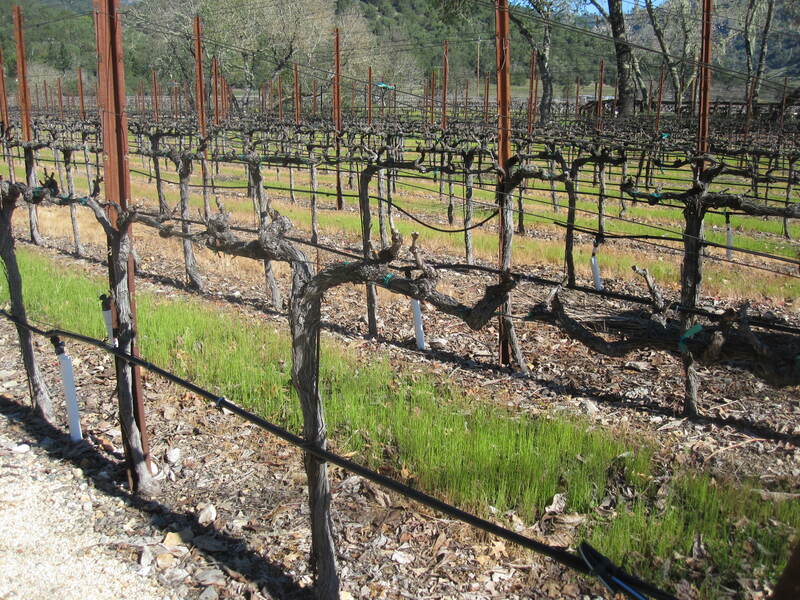 However, on a hillside vineyard, nutrients can be limited and water tends to drain very quickly, both factors that lead to lower yields on the vine. To compensate, the technique of cane pruning is utilized. Another benefit to cane pruning is it less harsh on the vine itself. With cordon pruning, each new shoot (usually 8 to a side for a total of 16) are pruned every year leaving the vine with many pruning scars. This leaves the vine much more susceptible to infections (such as Eutypa, described earlier). Because of this, excessive pruning can lessen the lifespan and efficiency of an individual vine. So, as you can see, many key decisions are made when planting a vineyard and lots of work goes into maintaining a vineyard as well…..and we have barely even scratched the surface of the complexities that go into creating and maintaining a vineyard that will produce quality fruit year after year. It’s a good thing that we enjoy it so much! 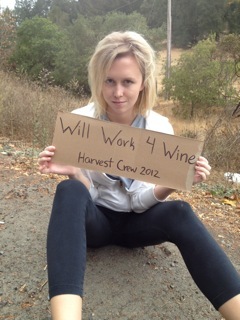 Guest Blogger: Jessica and Rob Return for Harvest 2012! Try as we might, the King duo cannot seem to get it together to be in Napa for the Kerry’s Vineyard harvest. There was still plenty do, however, when we met Jason at Cuvaison. 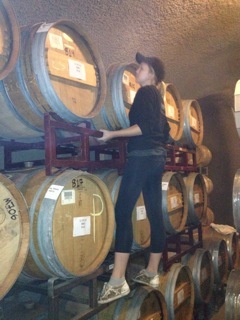 The wine was already in the tanks, and there were nutrients to be added. We measured out DAP and Superfood, dissolved it in water, and added it to the tanks. It is safe to say both my chemistry and measuring skills remain questionable, but this may be because I left my tentative grasp of the metric system back in high school with my calculus skills. Jason, on the other hand, measures out DAP in kilos like he is the Pablo Escobar of nutrients. After nutrients were added, the Kerry’s Vineyard tank needed to be punched down. Affectionately referred to as the “punch down of death”, this process involves standing on a wood plank over the tank and mixing the grapes and juice with a metal instrument. You may remember from the Harvest 2010 post that falling off this plank into the tank would mean suffocation because of the carbon dioxide emitted by the fermenting yeast. After we survived the punch down, we went to their Malbec vineyard to take samples. We zig-zagged up and down every few rows of grapes and took one grape from each point, making sure to grab grapes from different parts of the cluster each time. This is to account for different parts of the vineyard being exposed to more sun and other factors. We took the samples back to the office, crushed up the grapes, and filtered the juice into beakers. Tom put a few drops of juice into this little scientific machine to measure the Brix. We ended the day the only acceptable way: with cheese and a glass Tom Eddy wine. The next morning, we woke up bright and early to head up to Stagecoach for that harvest. After a very long bumpy drive up to the top of the mountain across which Stagecoach sprawls, we arrived at the vineyard just in time to see bins full of grapes be trucked down the way we came. Luckily Jason was already at Cuvaison waiting for the delivery. We then headed back down the mountain and made a pit stop to check out the Syrah that was still on the vines. When we arrived at Cuvaison, there was sorting, sorting, sorting, and more sorting to be done. The fruit looked great and there were very few MOGs (Materials Other than Grapes) to be sorted out. There were a few black widows calling the clusters their home, and were it not for my preoccupation with finding and avoiding spiders, Jason may not have lived to tell the tale of the never-ending Stagecoach sort. Nine tons and what felt like days later, we finished sorting and cautiously stepped down from the platform next to the conveyor belt, unsure of whether it was the platform or the belt moving after staring at grapes marching by for so long. A barbeque at the Eddy ranch concluded the day’s work. We opened our final day there with a breakfast at Café Sarafornia, which is always a staple during our trips: I am very much a fan of how many tea options they bring with your personal size teapot. My dad went with Tom to sample the Cabernet, and I went with Jason to the winery to inoculate the Stagecoach. 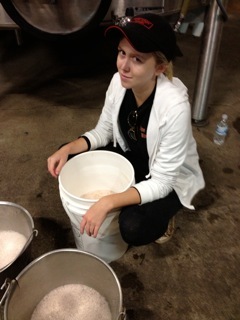 Inoculation is definitely my favorite part of the winemaking process. Seeing the “yeast babies” come to life is a magical process, and Jason takes special care to make sure as many of them as possible survive the inoculation process. There were a lot of juice adds to be done, but I managed to get the juice out of the tank without spraying wine across the room. 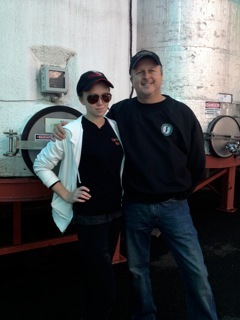 After the “yeast babies” were added to the Stagecoach tank, we added nutrients to the Kerry’s Vineyard tank again. We then went in to the cave to burp the bungs, as one had shot out of the barrel the day prior. Being the smallest of the group, it was mine to climb the barrel racks and remove the bungs from the barrels and let any remaining carbon dioxide gas escape. When this was done, it was time for us to head back to San Francisco, with a pit stop at Dean and Deluca. Covered in yeast, Superfood, and grape slime, we looked like legitimate members of the winemaking business decked out in our Tom Eddy gear. Apparently we weren’t the only ones who thought so, as a chef in Dean and Deluca stopped us to ask about Tom Eddy Wines. As another year’s harvest came to an end, we headed back to San Francisco anxiously awaiting a chance to return. Yes, the 2008 vintage (affectionately now known as the “wildfire vintage”) took us by firestorm (I know, cheesy pun). No one winemaker in the North Coast was immune to some challenging maturity schedules with such a moderate spring, but an extraordinary summer dry period, culminating with a significant amount of heat in the months of August and September, ensured our salvation. One of the blessings we have is that with a small program such as ours, and with talented growers working with us in the mountains with their small ranches, looking at the vineyard row by row, and even vine by vine, we were able to manage literally every plant (as impossible as it may seem). I would liken this care and attention to herding cats on a hot, sandy beach. You might ask how we could do such a thing…..Catskills! But honestly? Leaf canopy manipulation and very conscientious irrigation (to give those babies a drink at the correct time) was really the difference in our program in 2008. While some folks were lamenting about prunes turning to raisins, we were dancing lightly on our feet, and skipping around the vineyard coaxing in the upper-elevation breezes (cooling type that is). The glorious 2008 vintage was one of the smallest in our long wine career. From top to bottom, start to finish, we knew that we were facing a small, but high quality crop. Early indications showed few fruitful buds and Mother Nature had her way with us……..I think in an effort to prevent greed from setting in. No worries. Not only was the crop smaller but the berries were smaller. Normally, for most farming endeavors, this would be a difficult pill to swallow, but for our hillside winemaking with a singular goal of making elegant, long-lived wine, this was literally a God-send. Our benefit (or your benefit) is a very highly-structured, powerful, long-lived monster. I use this term “monster” with a timid piety, as well as a jaundiced eye, because our monsters are more cuddly and complex than most (kind of like the Sesame Street cookie monster washing down his Oreos with Bordeaux……….). That said, this may be the most robust and age-worthy wine we’ve made in a decade….almost similar to the 1992 vintage upon release. The flavors are evolving like “monsters”, so let’s go there and hold on the cookies for now. (this guy will age well for a long, long time). The 2008 vintage is very condensed, both organoleptically and quantitatively…….only 700 six packs will be bottled (same a350, 750ml- cases). It’s January and it’s bottling time. As we set out to bottle the 2007 Tom Eddy Cabernets (yes, there’s more than one), an enormous number of decisions need to be made. Of course, we will bottle the Cabernet in the standard 750ml (@26oz.) wine bottle which everyone is used to buying at the store, opening at home and drinking the recommended 3 glasses per night…no more, no less. Right? But we will also be bottling these wines into much larger bottles or large formats. One of these key decisions is how many Large Format bottles do we want to bottle? Shawn of Iowa with a 3L Tom Eddy Cab. Large Format bottles come in many different sizes: Magnums (1.5Liters or 2 regular bottles); Double Magnums (3L); Imperial (6L), Salmanazar (9L) and Balthazar (12L). You can do the math. Plus, we will be bottling several different vineyards: the 2007 Tom Eddy Cabernet; 2007 Spanos Single Vineyard Cabernet; and 2007 VSR (Very Special Red) Cabernet into one or several of these different sizes. Wines that are built to age (like our Cabernets), have enormously complex chemical reactions constantly taking place with dynamic interactions between tannins, acid, protein and color compounds, just to name a few. Over time, while the wine is in the bottle, tannins are polymerizing (linking together) with each other which softens the mouth-feel, hence the reason why young red wines are generally more astringent than older, properly aged wines. Oxygen plays a key role in this aging process. Put simply, a small amount of oxygen aids in the polymerization and softening process but too much oxygen ages the wine prematurely. This is where a natural cork plays its key role by allowing only a small amount of oxygen to trickle over time through its slightly permeable body. This is exactly why Large Format bottles generally can age for a longer period of time. Since there is so much more volume of wine in these larger bottles and the amount of oxygen that gets into the wine via the cork’s tiny pores is relatively the same as a normal size bottle, the aging process occurs much more slowly. In other words, a larger ratio of wine-to-oxygen intake allows for a slower, more methodical aging process and older, larger bottles of wine will generally remain fresher and more vibrant than their standard-size counterparts. So, not only do big bottles of wine inspire one’s jaw to drop in awe, they also serve a great function in the wine’s course of aging. And you just thought they were for big parties! So the next time someone breaks out a giant bottle of wine at a party, you can bore them with words like “polymerization,” “tannins” and “complex chemical reactions.”…..you’re welcome! Guest blogger Jessica with her Dad. Crush is a busy time for us and every so often we get some crazies who want to try a hand at it. But for Rob King, a long time Tom Eddy loyalist, making his way up here to Napa Valley each October is an annual pilgrimage. And this year he also brought his lovely daughter, Jessica. Here’s her take on the whole madness. “Seven years ago, my dad harassed his way into the Tom Eddy Wines harvest. Much to the Tom Eddy staff’s surprise, he showed up ready and willing to work the long days of picking, sorting, and crushing the grapes and—even more surprisingly—was eager to return for the following year’s harvest. Six years later, I decided to join him and pick Kerry’s Vineyard. Jessica checking the grapes in Kerry's Vineyard. Unfortunately, the weather disregarded our plans and forced Tom to push the harvest of Kerry’s Vineyard to Tuesday. I was somewhat dismayed and wondered what there would be left for my dad and I to do. As it turns out, there was a lot to do. Contrary to my belief that once the grapes are crushed the wine just sits in the barrel for a period of time, the wine has to be constantly tested and “fed”. First, we went through all the tanks and tasted all the wine, which—being only a few days old—can hardly be called wine; it is more like fizzy grape juice. It is very sweet and contains no alcohol because the yeast has not yet consumed the sugar from the grapes and, according to Jason, “pooped” out alcohol. 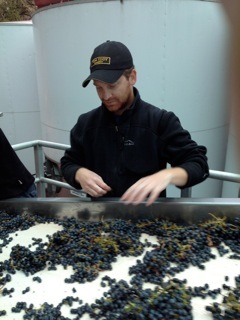 Assistant winemaker, Jason, taking Cabernet samples. After tasting the wine in large metal tanks, Jason and Tom informed us that in a few days the CO2 in the tank would be so strong that if a person was to fall into the tank, they would die in seconds because the CO2 would take up all of the oxygen not only in the air, but also from the person’s body. Rob & Jessica showing us how it's done. Next, my dad and I were put to the task of standing on a wet plank above such a tank to punch down the grapes..luckily we did not fall in. We then went to the task of inoculating one of the tanks, which is Jason’s area of expertise. 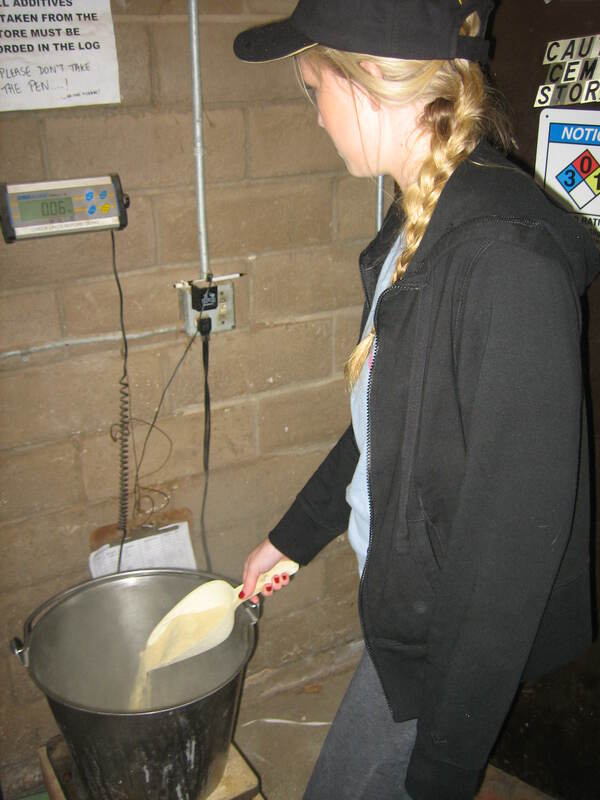 Inoculating involves rehydrating freeze-dried yeast and gradually incorporating it into the grape mixture. Jason likes to think of the yeast as “his babies” and takes a great deal of care to make sure “the babies are happy”. The yeast is re-hydrated in 95-104 degree water, similar to bath water temp, and juice from the tanks is gradually added to this mixture as to lower the temperature in such a way that it kills as little of the yeast as possible. After the inoculation process was complete, we mixed buckets of tartaric acid (which I had to taste after finding out that it’s what used to coat Sour Patch Kids), with DAP (diamonia phosphate: i.e.food for the babies), and a combination of dead yeast and vitamins called superfood. These three solutions are “fed” to the wine every few days in the first stages of fermentation. Tom and Rob checking tanks. After this, the hard work was done for the day and the only remaining task was going to several other wineries to taste the wines of some other clients that Tom Eddy Wines oversees. At the end of the day, we retired to the office and relaxed with some bread, cheese, and a glass of Tom Eddy Wine, of course. I hope to return for harvest next year!” (Dear Jessica: absolutely! Especially if you continue to share your experiences with us. We love reading your take and think others will too . KE). Mother Nature is always unpredictable and often persnickety this time of year: the 2010 harvest is no exception. As the weather worked us like an emotional yo-yo, we experienced the coolest season ever recorded accompanied by occasional heat spikes. But these same conditions allowed for some of the best flavor and color development possible . We all knew early on that we were at least 2-3 weeks behind schedule and we thought this was going to be a difficult year for flavors because of the delayed harvesting. But it actually seems to have worked in reverse because we had such a long hang time. Normally long hang time would increase sugars but in this case it resulted in concentrated flavors, solid acids and intense colors. Every lot of red wine I’ve seen this year has more depth of color of than any year that I can recall in my 37 years of making wine, and that’s not just Cabernet. Coupled with this color intensity, these longer-season grapes are wonderfully flavorful, with just the right amount of sugars: not extremely high but perfect for classic, balanced, full flavored wines. You’ll actually be able to have a glass of 2010 Cab and still mow the lawn.